In May 2014 Teresa Mooney bravely took to the air as she completed a Tandum Skydive with Moonjumper in aid of our charity. 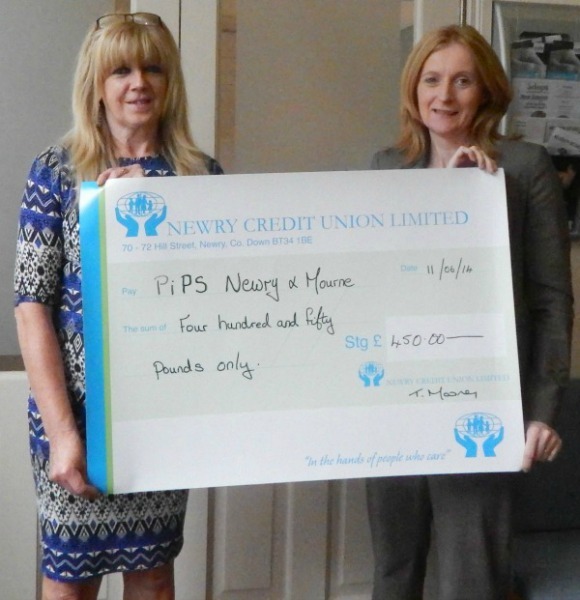 Through sponsorship, Teresa was able to make a donation of £450 to PIPS Newry & Mourne. Teresa would like to thank all her family, friends and staff at Southern Regional College for her generous contributions. PIPS Newry and Mourne would like to thank Teresa for her very brave efforts and kind donation. Pictured are Fiona Hughes (Left) PIPS N&M accepting a cheque from Teresa.